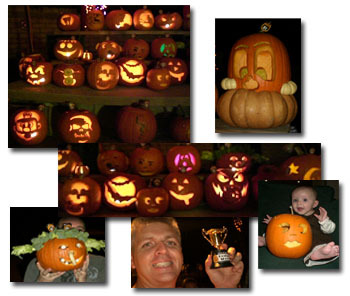 Every year we host a pumpkin carving party at our home and this year was lots of fun! Of course Southern California, where I live, has basically been on fire, so when it began to rain before the party it was hard to be upset. But the rain let up, lots of people showed up (60+), great food, lots of time with friends and the pumpkins were great! 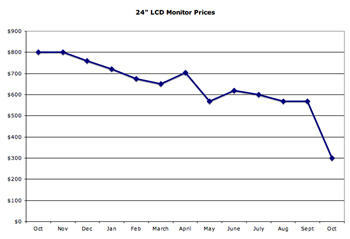 Here is an interesting graph showing the market price for 24″ LCD monitors over the past year. I have found running two widescreen monitors (shown here is my main work area with 21″ monitors) makes design work much more efficiant – but I should have held out for the 24″ monitors! Many years ago for images in our projects we relied on $300-500 per disk photo CDs and for vector art things like the 20 CD ClickArt 1 Million collection. Well, ClickArt is back – and now online. 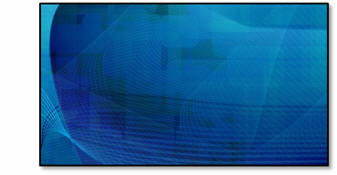 Although it features lots of photo images, they are relatively small at 800px wide and 72 dpi. The offering is wide, with many having those same 80/90’s fashions I remember from use years ago. But many are ultra new and even the same images I have pulled from sources like Photos.com (of course much smaller file size here). And if you need vector art (aka: clip art or line art), having a searchable database and unlimited downloads for a year is worth the price! 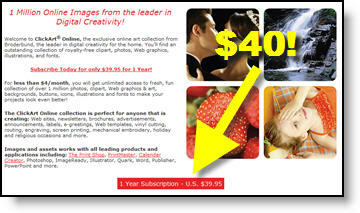 As for price, they are currently offering a 1 year, unlimited download for only $40.00!! When working on multiple computers it is critical to be able to tell which files are new, or old, based on their time stamp. The solution is to run an application that updates the computer clock to an atomic clock through the internet. 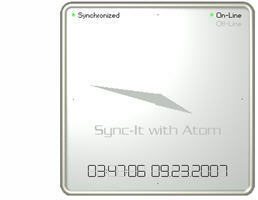 I run SYNCIT With Atom on all of my computers, but there are tons of applications available. I have mine set to update/verifty clock accuracy every 45 seconds. And guarantee I know which file is the latest-and-greatest based on the time stamp – no matter what computer I was working on. Click here to go to info/download page. Another free application from Microsoft that ranges from good-to-great depending on your monitor is the CLEARTYPE TUNER. It basically tweaks the way Windows displays text on an LCD monitor. It does not hinder, or noticably improve, displaying through a projector – and depending on your monitor it may or may not make a noticeable difference (on my 1900×1200 WXGA monitor it made a very noticeable effect, on a 1440×900 monitor it gave no noticeable difference). Being a graphic designer I admit that I understand things better when I can see them. One of the great features of the new Vista OS (and on Macs for awhile) is the ability to rollover the taskbar tab and see a thumbnail of the current application content. If you are running XP you can add this type feature to the Alt-Tab method of choosing your application. With the Free Microsoft ALT-TAB tweak installed instead of seeing just the application/file name as you alt-tab through the active items, you see a thumbnail of the current content. Click here to go to the download page at Microsoft. I often, as I am sure you do, have to download lots of files for a project (PowerPoint, Photoshop, images, PDFs, etc.). Unless all are on an FTP site I can access with an FTP application your browser limits you to 2 simultaneous downloads. Great if I was on a bandwidth limited dial-up modem, but I have a 15mb/s connection and want to download more. Now that you have burrowed deep into the OS, you need to add to new values (the ones that say let me download up to 10 files simultaneously). These next steps you will repeat twice, once for each needed value. You are now free to download up to 10 files simultaneously (provided you have enough bandwidth with your internet connection)! This is one of the nifty features of Windows (XP) that no one seems to know about. Before a presentation, I use the “show/hide desktop icons” feature to hide every single item on my desktop. That way if I need to exit a presentation for any reason, the only thing projected is a my desktop wallpaper. 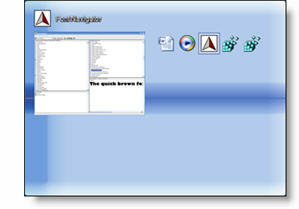 After the presentation, I restore all in just one click. 4. Let the screen refresh (may take a few moments) and you are left with a completely clutter free view! This lets me group all of my presentations together, slide outlook to the far left, etc. Or another practical use (this week in particular) is designing a multi-screen show and being able to move the presentation tabs to the visual order (ie. left screen appears on the left, center in the center and right screen presentation is the right tab). 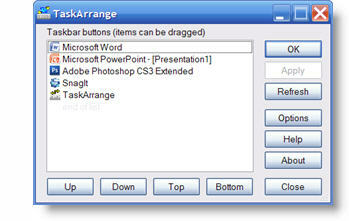 Click here to go to Task Arrange’s download page.